This sophisticated reclining sofa reclines on both ends to provide the ultimate in comfort to your home. With this contemporary double reclining sofa, you can slow the pace of your busy life in a living room or family room. It offers comfortable pillow arms and a padded back for a great place to watch TV or simply spend time relaxing with family and entertaining friends. The Alpine Contemporary Double Reclining Sofa by Lane at AHFA in the area. Product availability may vary. Contact us for the most current availability on this product. Fabric Content To draw your attention, a fabric has to be durable as well as beautiful. 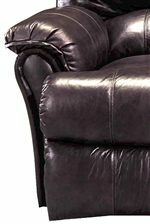 All of our leathers and upholstery fabrics are tested to ensure durability over many years of use. The seams are reinforced to extend the life of your upholstery. Recliner Mechanism Precision engineered, Shoulder riveted in major weak points, Lubricated pivot joints Engineered for maximum comfort in all positions, precision-balanced for ease of operation, Delrin spacers used for ease of operation and maximum wear. The Alpine collection is a great option if you are looking for Contemporary furniture in the area.